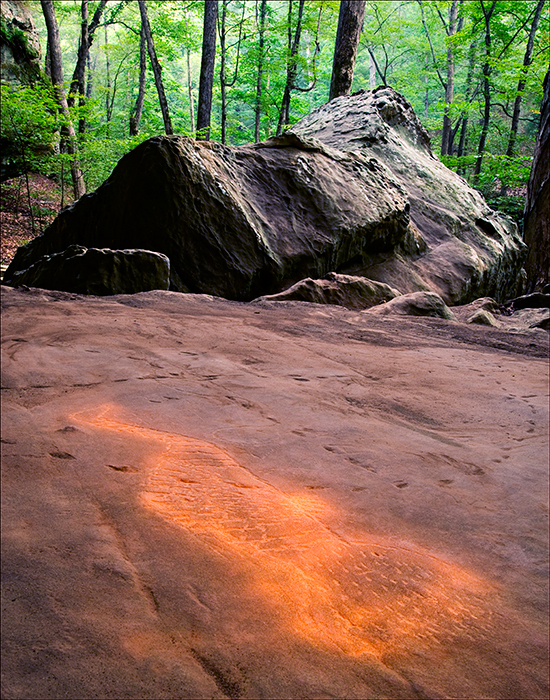 Near Kentucky's border with Illinois are many boulders, cliffs, rock shelters and signs of native peoples who inhabited the area centuries ago, an area known to few as the Shawnee Hills. These particular petroglyphs are examples of evidence left. I had previsualized something like the image you see here months before I actually ventured out to photograph. It took four trips into the preserve to get the right light. I shot early on a July morning, using a long exposure, giving myself time to light some of the drawings with the orange glow of my flashlight. What are the petroglyphs of? I say a hen turkey, what do you think?